Mike Lips Last Lunch is a mission in Grand Theft Auto III given to protagonist Claude by mechanic Joey Leone from his garage in Trenton, Portland, Liberty City. Note: The mission is only accessible between the hours of 5:00 am to 9:00 pm. Claude walks in and is told by Joey Leone that the Forelli brothers owe him money and that he is tired of waiting, needing Claude to teach them some respect. He tells Claude that Mike Forelli (possibly a brother of the Don of the Forellis) is eating at Marco's Bistro in Saint Mark's and tells Claude to rig a bomb to Forelli's car using 8-Ball's bomb shop in Harwood. 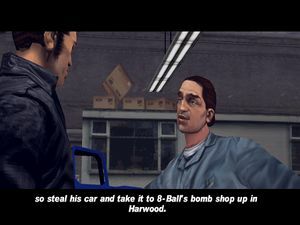 Within a time limit of six minutes, the player is required to head to Marco's Bistro, steal Mike Forelli's car, drive it to 8-Ball's bomb shop, have the bomb rigged and returns the car to its original location. Upon completion of the task the player is treated with a cutscene of Forelli slowly leaving Marco's Bistro, entering his car, and perishing as the bomb detonates. Misty: Hey, I'm bored, when you gonna drill me? Joey Leone: In a moment sweetheart, I've got a little business to take care of. I've got a little job for you pal, the Forelli brothers have owned me money for too long, and they need to be taught some respect. "Lips" Forreli is stuffing his fat face in St. Mark's Bistro, so steal his car and take it to 8-Ball's bomb shop up in Harwood. You know 8-Ball, right? Once he's fitted it with a bomb, go park the car where you found it. Then sit back and watch the whole show. But hurry up, he won't be eating forever. The reward for completing the mission is $10,000. "Farewell 'Chunky' Lee Chong" is also unlocked after completing the mission. The Marco's Bistro sign reads "Eat till you explode! ", is a nod to Mike Forelli's death. Claude approaching Mike Forelli's car at Marco's Bistro in Saint Mark's. Claude driving Mike Forelli's car into 8-Balls garage. Claude parking Mike Forelli's car back in its space. Mike Forelli walking to his car after finishing in Marco's Bistro. This page was last modified on 3 July 2014, at 15:49.